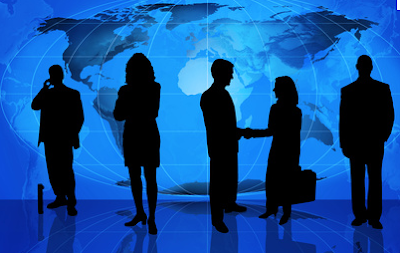 Will our students be ready for a global workplace? Last year, Salisbury Township School District implemented Professional Learning Communities K-12 as a way for teachers to model the District’s Mission Statement: Inspire, Think, Learn, Grow ~ Together. And together we have learned and taught, researched and studied, traveled in real and virtual time ~ and grown professionally. In year two, with largely the same teacher-selected teams, we are extending the ways we learn, and one of our best experiences to date has been with Discovery Education‘s Jennifer Dorman. 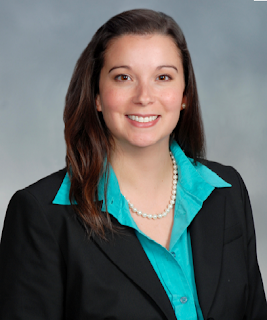 Multi-talented and multi-tasking, Dorman brings to her presentations years of classroom experience as a high school history teacher and more recently a Discovery-Wilkes professor. She is always dynamic, interactive, and innovative. Kudos for the idea to tap into the Dorman difference goes to fellow DEN STAR Jennifer Brinson, our high school‘s Instructional Technologist. Because our high school is transitioning to a block schedule next year when the ninth grade joins us for a 9-12 configuration after a two-year massive construction project, the PLC team I joined segued from exploring Remediation to Project-Based Learning on the Block. 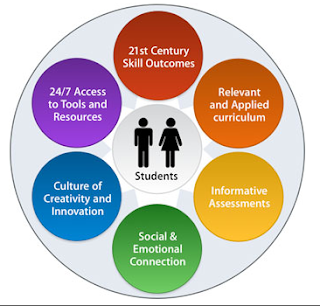 Our goal is to discover and integrate best practices from traditional and project-based learning, transforming student learning within the block. 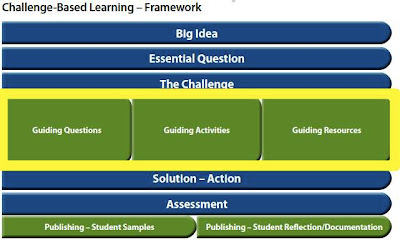 But within a few minutes with Dorman, we realized PLB was the stepping stone–and a good one–to Challenge-Based Learning, our new end-of-year implementation goal. As always, Dorman began with resource sharing, and does she have resources, enough to keep our team busy for the year. Dorman’s favorite website for Project-Based Learning is Apple’s Challenge-Based Learning, stating they do a fantastic job. She began, however, with PBL, stating that “true project-based learning” is a cultural shift in the classroom and changes how teachers and students are defined–how they and we interact and how students interact with new skills and knowledge. Redefined as Challenge-Based Learning, this type of learning is different because of the element of technology in the process and publication of the final project. To understand the difference, Dorman supplied a comparison. Traditional PBL occurs in a single classroom with 1 teacher and 1 project. The final outcome would be the project or the enactment, posted where the teacher warehouses outcomes, and the outcome would be somewhat limited in scope. On the other hand, CBL is not just doing projects, although it does involve hands-on work. 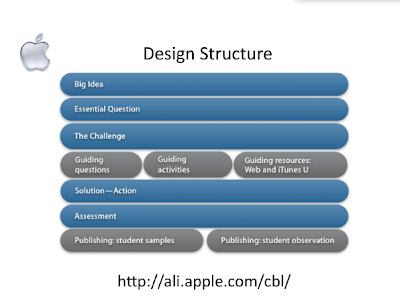 CBL uses technology for the processing component, to teach research, manage information, communicate among students and teachers, make the results transparent (all PBL to this point), but includes publishing to the challenge and reflecting on the efficacy of the solution, going beyond presentation and product. Today we know technology will be an essential part of the process of the design structure for CBL. Developed by Apple for Classrooms of Tomorrow Today, ACOT2 is piloted as CBL. Students take a look at the Big Idea, which should have global and local relevance. This combined relevancy creates the cultural shift, since this design structure, like Wiggins and Tighe’s Understanding By Design, is similar in nature to CBL. Students take a look at the Big Idea, which should have highly engaging relevance beyond the classroom for the entire world. For example, Dorman suggested diversity, sustainability, and empathy as possible big ideas. It is the students’ job to define the big idea and make it workable to the Essential Question. The Essential Question provides the context for the Big Idea, making clear why the big idea is so important. An example of an EQ with the Big Idea of Sustainability: What is cultural identity and how does it define my consumption of fossil fuels? If students struggle with conceptualizing the Big Idea, this part of the project design can be constructed by the teacher; however, the rest of the project should have a definite student design imprint. This would be especially true in high school, where students begin to engage in the process. The Challenge is articulated next. Students are asked to create the challenge, which must be able to be acted upon in Pennsylvania (your state), and is the student’s way of addressing the challenge. Continuing with the idea of sustainability, the challenge could be to improve your school’s or your personal use of fossil fuels, or could address how to limit the use of fossil fuels. Whatever is decided as the challenge, it MUST be actionable by the student. 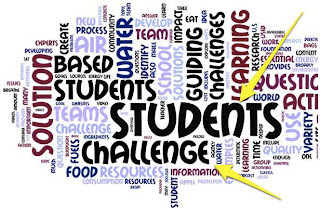 After the Challenge is implemented (brainstorming with/by students) and agreed upon, teams connect globally with students, and if you can, you work on the same or a related challenge. Next steps: Guiding Questions, Guiding Activities, and Guiding Resources. Guiding Questions occur as students break down the Challenge. To address the Challenge, what do the students need to know? Students develop Guiding Questions with 21st century skills by determining what they need to know before they attack the Challenge. If content is new to students, they may have many Guiding Questions. Guiding Activities are research-driven, either to create or expand students’ schema. There are many Guiding Resources, including Google Forms, iTunes University, the Web, and Video Skyping with authorities in the Challenge’s field. Students can warehouse resources in Diigo, through screencasts, The process of how students research, gather, and collate resources can vary and depend on how the teacher structures the CBL experience. Students using Diigo make data aggregation transparent; the teacher can comment on the annotations and help guide student work. The Solution-Action must be actionable in students’ locality; they must physically implement the project. The Solution is not the end of the project as it would have been in PBL. CBL must create an implemented Solution and then it must be documented. The Solution may not work and students may find what they planned does not work, and that is totally ok because the Solution is NOT the end of the process. In the Assessment phase, students track the evaluation of the CBL and may learn they need to start over. This is where the cultural shift in education truly begins. There is no single right answer. Students identify why something does not work, and like Edison who found 1000 ways the light bulb would not work, students work to identify what did not work in their CBL. And that is a real 21st century skill. The final two steps truly distinguish CBL from PBL. 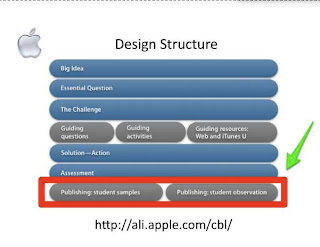 The end step in the CBL process is Publishing Student Samples and Publishing Student Observation. Blogs and podcasts work effectively for tracking student work and publishing reflections. Voicethreads and Glogsters are also great Web 2.0 publishing tools, but for overall CBL storage, for one-stop assembling of all resources, Dorman likes Wikispaces best. As someone who has engaged in PBL for 14 years with colleague and friend Jennifer Brinson in the Integrated Project, as excellent a project it was, the one component it failed to address, the one thing that would have taken it into CBL was making a global connection. If for that alone, the project would be worth reprising from retirement, just to make that global connection. A very special thank you to Jennifer Dorman, who delayed her trip to home base to accommodate our District’s initiative. You are the best! Jen is a great resource and the perfect person to teach Challenge Based Learning. I am working at moving my Forensics classes over to project based learning, so I will keep this post in my archives as I plan for next semester and year. Thank you four your nice writing on Virtual Visit With Jennifer Dorman: Transforming Student Learning.